I was very pleased to be one of the speakers at an event last night, organised by the Aberdeen Student Left and English Literature Society. 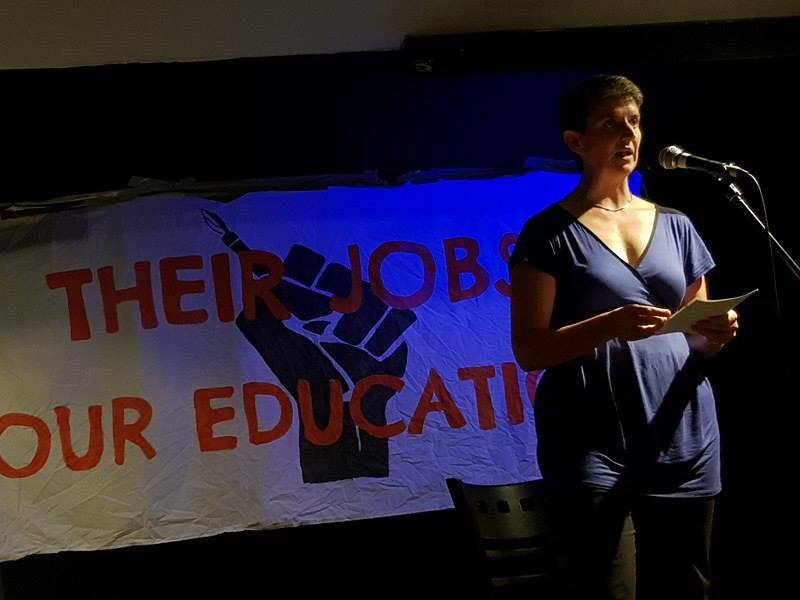 It was a fantastic evening, with poetry, comedy, music, and of course, politics, designed to raise awareness of and money for the National Demo for Free Education taking place in London on 15th November. As Rector of Aberdeen University, I have been very pleased to support campaigns against tuition fees and also to stand in solidarity with staff against redundancies. As a long time member of NCAFC – the National Campaign Against Fees and Cuts – and a trade unionist, I firmly believe that education is a right that should be accessible to everyone. I also know only too well the negative impact redundancies has on students and their education. With the disaster for Higher Education that is Brexit looming, I also believe we have to be vigilant and not lose the benefits that European students currently receive. I want to extend the no-fees policy to all students, but we really can’t afford to see it rescinded for EU students. So, last night, I stood up to speak in support of free education. Growing up in Zimbabwe, in a new country freshly liberated from white minority rule, I benefited from the government’s focus on education as the route to success. Now, the more recent reality in Zimbabwe is less positive, but the value placed on education has left an indelible mark on me. Education really is the way to a better society. I recently returned from a few weeks in Zimbabwe: I was there visiting my Mum, and helping her celebrate her 80th birthday. Whilst there, I had the privilege of speaking at the annual Prize Giving at my old school. I had lots of interesting conversations with teachers who are doing their best in difficult circumstances to prepare the next generation for the world. I also met many students, many facing hardship way beyond my experiences. School fees are required; they are not exorbitant, but they are there, and for families with more than one child, the financial commitments (and difficulties) are multiplied. One family’s story in particular has stayed with me. I met the parents of three daughters, three young women, who are all in school, all determined to learn, to engage with the world, to make the world a better place for themselves and those around them. But both parents had recently been made redundant, and did not face any prospects of finding decent jobs. To pay for their daughters’ education they had sold their car, sold their cows, sold their jewellery, and even considered selling their house (although who wants to be homeless in the middle of exams?!?). If secondary education bleeds them dry like this, what future do these three young women have of realising their dreams to go to university? And I don’t need to convince many of the students I interact with at Aberdeen University and elsewhere of just how important it is to educate people, and to educate women in particular. We know the social and economic benefits that communities gain from educating women. Education is the route to a better society. As such, it should be free, not just for the bourgeoisie! So, just why is free education so important? Firstly, the market has no place in education. Market forces do not value what really matter: the market cannot adequately value education or its transformative powers. Second, tuition fees and inadequate financial support to live leads to debt. And the student debt repayment system is just a nonsense – it is very complex and very inefficient. But more than this. Debt is a way of disciplining workers, of forcing people to pursue market-valued careers, careers that might well be useless (finance comes to mind, given the financial mess of the last nearly 10 years), rather than creative and caring careers that provide solace for the soul or care for our communities. People are driven out of and away from careers that are socially helpful, like nursing, teaching, caring, creating, just to repay debt. And they are forced to be compliant workers: just cogs in the neoliberal economic machine, not complaining, not causing a fuss. Third, and still on debt: debt is not only bad for the economy, it is bad for all of our mental health. Debt and financial pressures are a major source of anxiety, depression and other ill-health for students and young people. Why support a system that we know makes us ill? So, for these, and many, many more reasons, I whole-heartedly support the work of NCAFC, of Aberdeen Student Left, and all those seeking to eradicate fees. I won’t be able to attend the National Demonstration in London next month, but I stand with you all: solidarity as you strive for justice! 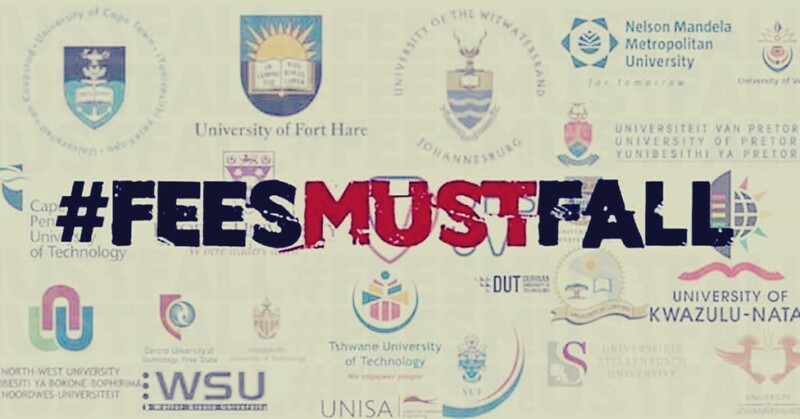 This is another column I wrote for Aberdeen University’s student paper, The Gaudie, about the Fees Must Fall campaign in South Africa and how education must be the foundation of a better future for all. I grew up in Zimbabwe just as it was freshly liberated from decades of white-minority rule. And the new government focused on education as the new country’s route to success. That road to success hasn’t been an easy one, but it left me with a commitment to education as the best way for a society to achieve. I’m currently visiting my family in South Africa, where education is the issue of the day. Students have launched a Fees Must Fall campaign, going on strike over the government’s fees policy. Over the past year this has put higher education at the heart of the debate about where South Africa’s future lies. In the recent municipal elections the ANC, the party of Nelson Mandela, lost control of city government in Pretoria (Tshwane), Johannesburg (Egoli) and – most symbolically – Nelson Mandela Bay. The new city governments seem likely to be an alliance of the liberal Democratic Alliance, who want to privatise services, and the ultra-left Economic Freedom Fighters who want to return land and property to the majority. It seems an unlikely marriage. And one most likely built on convenience or opportunism. The reason the ANC have lost control is their failure to definitively choose an approach that transforms the lives of people sufficiently quickly. Far too many people still don’t have decent housing – or indoor toilets. Meanwhile the towering heights of the South African economy are owned by a tiny, monied, class. A class underpinned by the work and education of the many and the extraction of natural resources owned by all. So University fees have become a key issue in this debate – with many claiming that University should be the lowest priority for a country with serious housing, health and infrastructure issues. It is a disgrace that South Africa has areas of the worst housing anywhere in the world. But to argue that these are higher priorities than education is to miss the point. While the huge mining concerns are making massive profits it’s that money that should be used to transform the country. Paying for houses, hospitals and decent public transport can be done with the nation’s wealth, while also allowing people to benefit from open access to University and technical education. So while Scotland and South Africa are different in many ways, the issues are very similar. If we want decent education we need to make the argument that it is more important than the eye-watering profits of the big companies. In Scotland, as in South Africa, Fees Must Fall! As Rector of the University of Aberdeen, I write a column in the student newspaper, the Gaudie. Given the recent discussions (!) about immigration and education, I thought I’d post my piece from a couple of weeks ago here. Welcome (back) to Aberdeen, and to this wonderful community of learning, living, playing, and laughing. As Rector, it makes me very happy to see you start or return to your studies at the start of a new academic year. I welcome you all, wherever you come from in the world: regardless of what is happening in the media and in UK politics, I want to assure you that you are welcome here. And I am pleased, too, to be writing this column, reinstating the Rector’s Rambles; my take on issues, events or other ponderings that I hope will be of interest to you, and will challenge you to think a little bit differently about the world. The position of Rector is an interesting one; one that tells you a great deal about this institution and and Scottish Higher Education more generally. Rectors are directly elected by you, the students, every three years, and they chair the University’s governing body, the Court. They are a clear statement of and commitment to “the democratic intellect”: that universities exist to serve not just themselves, their students, or their staff, but the wider public good, to improve and support our society and make our world better for all. At the start of the year, we might all take a moment to pause to consider the important role education plays in Aberdeen, in Scotland, and the wider world, fostering the intellectual life of this great city and of the nation. Education is not just for the very rich who can afford it, but for all who can benefit from it. Education is about so much more than obtaining knowledge and skills to become cogs in the machine of the labour market. It is about expanding our minds, our horizons. It is about pushing the boundaries of the possible to create a better future for our people, our communities, our world. It is most definitely NOT about the market, or about treating students as customers. If we look back to Ancient Greece, which, amongst others, created the foundations of thousands of years of Western thought, we see that education was about the power of curiousness, enquiry, experimentation, not the power of the market or the power of citizens as customers. Given the political and economic context of Scotland, the UK, Europe – and Aberdeen – today, we have to come together and work together to ensure we do not lose sight of the purpose and value of education, of ourselves as citizens, of this great institution. I look forward to meeting many of you over the coming year, seeing your minds and hearts grow as you learn, teach, work and play, and working with you to create the changes our world so desperately needs. Maggie Chapman has called on Robert Gordon University to tear up Donald Trump’s honorary degree over his repeated racist diatribes against on Muslims. Trump’s most recent islamophobic outburst came yesterday, when he called for “a total and complete shutdown of Muslims entering the United States”. Maggie is Rector of Robert Gordon’s neighbouring Aberdeen University. She said both institutions – and the city as a whole – would be damaged by continued association with the far-right Presidential candidate. Robert Gordon University presented Trump with an honorary Doctor of Business Administration degree in 2010. “Donald Trump’s disgustingly racist campaign shows he is an utterly unacceptable ambassador for our gloriously global city and its international universities. “His fascistic proposals to make Muslims wear identifying badges and, now, to ban all Muslims from entering the country are the policies of far-right extremism. “While we hope that he will not get the chance to implement them, pronouncements like these from politicians and media drive islamophobic aggression, exposing Muslims to more and more discrimination, harassment and violence. “Continuing to honour Donald Trump risks sending a signal to current and potential students, staff and partners that they are not respected, and that they are not safe. “Robert Gordon University would never give an honorary degree to a leader of the BNP or the National Front. Donald Trump is no less a racist extremist, and is just as unfit to hold that honour. An online petition calling for Trump’s degree to be withdrawn is set to easily pass its target of 5,000 signatures. Today I had the huge honour of being installed as Rector of the Univeristy of Aberdeen. This is my installation address. “Good morning Pro-Chancellor, Principal, ladies and gentlemen, and for those of you who organised my campaign, comrades. I am honoured to be able to address you today, and delighted to stand before you as your rector. It is a huge privilege to have been elected by so many of you to serve you over the coming three years, and I look forward, very much, to the challenges that I hope we will face together. One challenge that it appears I must face alone, however, is the small matter of being carried around on Angus the bull. I approach that with some trepidation, but rest assured, I won’t attempt to filibuster my way through the whole of today to mean that does not happen! I must start with some thanks. Firstly, to all those involved in organising today: Julie Beattie, Emily Beever, and many others – I am grateful for all you have done to pull this together. I am immensely grateful to the students in involved in the Shared Planet society for asking me to stand for election last year – it really was an honour to be asked. And I would not have made it to today without the cajoling, organising, campaigning, banner making, and so much more by Eva, Lina, and the rest of my campaign team. And I’d like to thank the University for being so welcoming and open, helping me find my feet around this mighty institution. And my close friends and family for their tireless support, advice and love. Huge thanks to those who have managed to travel to share today with me. Unfortunately my mother cannot be here – Zimbabwe is just too far away sometimes – but I know she is with me in thought. I am sorry that my Dad didn’t live to see today – he would have loved the robes and Angus. And finally Peter – thank you for your patient support, and for being you. I am very much aware of the significance of the job that lies before me. I have heard so many good things about my predecessor, Maitland Mackie, and his tireless energy and enthusiasm working for students here. His are certainly big boots to fill, even if the robe didn’t need altering! I am grateful for what I have learned of this role from hearing about his good work, and also the work of Rectors at other universities. Firstly, and perhaps most importantly, to be an advocate for students, ensuring that student concerns are taken seriously by all parts of the university. I hope to make a nuisance of myself in as positive and nice a way as possible to achieve this. Secondly, to participate in the governance of the university, operating not from a management perspective, but from one that is about democracy and good governance, to ensure that learning is at the heart of everything that we do, and that we resist the ever increasing pressure to become commercial graduate factories. And thirdly, to encourage the university to be much better at transforming our world for good, not just by the education we pass on to our students, but by how we use whatever resources we have to make this world better for all who live in it. We face two great crises as a society – one that is economic, and one that is environmental. The economic crisis is manifest in so many ways: the increase in low quality, low paid jobs, motivated by the economic elites desire to turn a quick profit; the decline in standards of living for the majority, the unaffordability of basic human needs like housing, heating, food – things that should be a right. And the environmental crisis, driven by fossil fuel extraction, the wasteful materialism of capitalism, and the destruction of so many human and non human lives in our quest for more stuff. And young people are bearing the brunt of these crises – for the first time, our generation (or mine and those that follow me), face a worse economic environment than our parents, with record increases in house prices, poor graduate employment, low levels of economic security, and the threat of environmental catastrophe. Young people are paying for a crisis they had no role in creating. This generation faces greater responsibility, but has less support than any post-war generation, being excluded from higher education, secure work, decent housing, by people who benefited from free education and other universal benefits, and who were not shackled by systems designed to load them with debt. Those of us growing up after Thatcher came to power in 1979 have been subjected to a brutal attack in the form of neoliberalism, where competition and individualist success, in our school system, in housing, everywhere, are what drive society. A system designed not to develop everyone, but to support the few at the expense of the many, to discipline and punish those who do not or cannot play the game. Our generation faces graduate unemployment of 20%, a vast reduction in the number of stable, rewarding careers available to us, the indignity and exploitation of unpaid internships. One and a half million people under 30 are unemployed. The average age of first time house buyers is 37. And that’s before you consider the long term impact of climate change and the privatisation of the NHS in England. We must continue to create a better world, not abandon what we have achieved over the past 70 years. And while this is happening to us and our future generations, the elite get wealthier, the inequity gap gets wider and the planet gets hotter. We need is a just transition away from dependence on fossil fuels to clean energy systems and from an economic system that creates huge inequality to one that puts people before profit. We need to create a politics that recognises generational differences. We need a generational politics. And this is no mean task! We will face significant opposition and challenge, from those who are benefitting from the status quo. Already the criticism of the desire to change has started. Resistance similar to that faced by those developing a gender politics, a politics of race, or of sexuality – the important struggles that defined previous generations, but are still significant today. All of these must receive attention if we are to create a better world. And we will need to work hard to counter the voices that say it is not possible to reclaim a caring society for our and the next generations. We know from the struggles against slavery and apartheid that social change is possible. But such change needs effort, it needs spokespeople, it needs a movement of supporters behind it. It needs a new politics. And it needs places for this new politics to thrive. I believe that Aberdeen University can be one of these places – universities are often where social and economic change originate. By taking your enthusiasm for a better world, by drawing on your experiences of rent inequalities, dodgy landlords, poor employment prospects, you are crucial to the movement for social change. And I want to use my role as rector to support you in these aims. I hope to be able to bring this new politics to the role of Rector. To campaign on the things that matter to you, to improve the transparency and openness in our governance so you can take this out into the world beyond university. To make sure the university is in the lead in promoting sustainability and the transformation away from a fossil fuel based economy towards a green economy. Just as there needs to be replacements for the high paying jobs of the ff industry, we need to find new ways to generate energy that work for the common good. Aberdeen certainly has the potential to be a world leader for a caring, socially just and sustainable future. I promise to work hard with you all, staff and students alike, with Emily and her team of current sabbaticals, and Genna and the new team, recently elected, to ensure our students are well prepared for this challenge ahead. I will continue to campaign against the terrible consequences of austerity, genera rational discrimination, and the demonising of the young and the poor. Together, we can create a better world, where we can all look forward to a fulfilling future, and where we put people at the heart of everything we do. I am fortunate enough to be the Educational Institute of Scotland’s University Lecturers’ Association (EIS-ULA) delegate to the STUC Women’s Conference happening in Dundee this week. One of the (30 or so) motions up for discussion was on gender inequality in higher education governance (full details of motions here). The motion was proposed by Angi Lamb, from the University and Colleges Union, UCU, and I seconded it on behalf of the EIS. Below is my speech. The story of Scottish higher education is overwhelmingly a good one. Scotland should be proud, rightly proud, of its Higher Education system. The intellectual engagement that happens in our universities rivals, indeed many would say exceeds, that of our southerly neighbour. And this intellectual tradition has, I believe, a crucial role to play in Scottish society, culture and economy. How this system is governed, therefore, must be of concern to us all. University courts are the governing bodies of all Scottish Higher Education Institutions (HEIs), and membership of these bodies is comprised of a mixture of internal university people: academics, university administrators, sometimes students; and external lay people: those whose skills and expertise complement those of the internal members, and serve to challenge institutional parochialism and provide a broader context for governance, of business, international or other important concerns. These courts have overall responsibility for the mission and strategic vision for universities, oversight of systems and processes, including employment practices, finance, welfare of students and staff. They also, incidentally, have responsibility for the setting of principals’ salaries, which as we heard earlier, have risen to an average of £242,000 whilst academic and support staff have seen their salaries cut by 13% in real terms in the last 5 years. The last time there as any kind of reassessment of University governance was in the 60s, when the Robbins report sought to democratise institutions, without really changing very much. So, a couple of years ago, the Scottish Government commissioned a review of the governance arrangements in HE. Professor Ferdinand von Prondzynski, the principal of RGU was appointed the chair of the review panel, and he, along with 4 other white men, undertook a review of the governance arrangements in HE. They spoke to people from each university, academics, administrators, students, and they published their report last year. This review contained many recommendations, which both UCU and EIS broadly welcomed – we would have gone further, but the recommendations themselves would be a fantastic start to improve HE in Scotland. So, gender equality was very clearly positioned as a crucial aspect of open, transparent governance. In response to these and other recommendations, university chancellors, principals and senior administrators had several fits, and decided to draw up their own Code of Governance, which largely ignored everything the ‘von Prond’ review said, but was agreed by all Universities, and imposed earlier this year. Perhaps unsurprisingly, the Code says nothing about gender balance in university governing bodies, nor the active inclusion of women in the key functioning of universities. At a time of change and uncertainty, when, like with so many other areas of life, HE faces funding pressures, the prospect of tuition fees, restriction in the ability of people to access HE, ever-increasing student debt, and so on, we need strong, effective, open governance. We want HE to be a significant contributor to what drives Scotland’s future, playing its role as effectively as possible, with the widest consent and support possible. We want our young adults and lifelong learners to be able to fulfil their potential to the greatest extent possible, and with the greatest possible amount of public satisfaction, enthusiasm and support, so that Scotland can be recognised as a place of critical intellectual curiosity, and scientific and cultural innovation. And so we must have effective and fair governance system. We need to pressure the Scottish Govt to make good its promises it implement the recommendations of von Prond, and implement it in full, including the recognition of the importance of gender balanced governing bodies. In many ways, ﻿﻿﻿﻿﻿﻿﻿﻿﻿1998 seems a long time ago. It was before 9/11 and the war in Iraq. It was before any of us had heard about Al Qaeda, nevermind the War on Terror. It was before Hurricane Katrina, and before the sequencing of the human genome. Quite an unassuming year, in fact. Yes, it was the year of the Omagh bombing, and the opening of the Akashi-Kaikyo Bridge. More significantly for many in the UK, however, it was the beginning of a very slippery slope. Tuition fees were first introduced in the UK by the Labour Government under Tony Blair, and students who began their undergraduate degrees with me that October had to fork out up to £1,250 for the privilege. And this was means tested, whether or not parents/family were prepared to offer support. University applications decreased for the first time in a while that year, and UCAS data show that it was the poorer students who were put off most. In 2006, students in England and Wales had Top-Up fees imposed on them, also by the Labour Government, taking the price of a degree to over £3,000 per year. Unsurprisingly, university applications took a dip that year too. In Scotland, the case was slightly different, with a graduate endowment being imposed instead of up-front fees. This was scrapped by the SNP in 2007. The proposed trebling of tuition fees from 2012 will have a catastrophic effect on education, young people’s lives, and the economy. How many young people, aged 17, come from families that can afford £9,000 a year for a degree, on top of the ever increasing accommodation and other living costs? What does it say about the current coalition Government that they have decided not to invest in education, but instead have chosen to price the majority out of this public good? As a lecturer at Edinburgh Napier University, I know what it means for people to be the first in their family to come to a university, to become independent thinkers and learners, and to graduate in spite of difficult circumstances. If Scotland had tuition fees, most of my students would not be at university at all. Scotland has always valued education differently to the rest of the UK, and thankfully so. So we must very definitely and defiantly stand up with our colleagues in England and Wales, and fight against the proposals that will see generations of young people deprived of the right to broaden their minds, simply because Mummy and Daddy couldn’t afford to send them to Eton. I am angry about the proposals of this coalition government to treble fees, especially when this means breaking a promise to abolish fees. But I am angrier at those who opened the floodgates 12 years ago. The party of the people? I think not. We said then that the increasing of fees would be inevitable after they were introduced … and sadly, we were right. Labour laid the foundations for what we see now: a government determined to attack the poor and the young in order to make the rich richer. Why is it ok for the wealthiest 1000 people to increase their wealth by £77 billion last year (that’s more than one third of our £167 billion deficit! ), but not ok to fund Higher Education? Student fees, and the public services cuts that are being introduced alongside them, are not necessary. They are a choice made on behalf of the rich against the poor and most vulnerable. I will not take this sitting down.